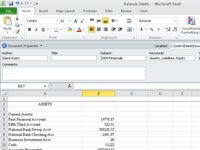 In Excel 2010, you can use the Document Information Panel to add or change workbook properties such as the Author, Title, Keywords, Status, and Comments that relate to a specific workbook. 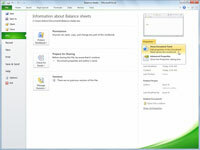 Adding metadata such as this can help you to better identify and manage your workbook files. 1Click the File tab, and from the Info panel, choose Properties. A list of options appears in the right panel. 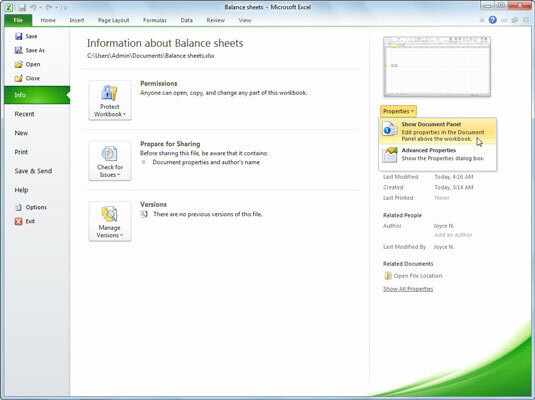 The workbook reappears, and the Document Information Panel appears just below the Ribbon. 3Enter identifying information, such as the author's name, subject, or a list of keywords. The information you enter here can be used with the Search function to help find a workbook. 4Click the Close button to close the Document Information Panel. The Close button is located in the upper-right corner of the Document Information Panel.